As video emerges from the city of St. Louis showing both peaceful protests and violent riots in recent days, there is one video that is raising questions about just how far riot police will go to enforce their will over the people. An older woman is featured in a video posted to Twitter by the local Fox affiliate. While the majority of the violence has occurred at night, it is broad daylight in the video, and the women appears to be showing no signs of violence, other than walking towards a line of police officers wearing riot gear. The woman was face-to-face with one officer’s shield, when a neighboring officer shoved her with his shield and pushed her to the ground. As another protester tried to help the woman up off of the ground, police began to push him out of the way, even going as far as to douse him with pepper spray. 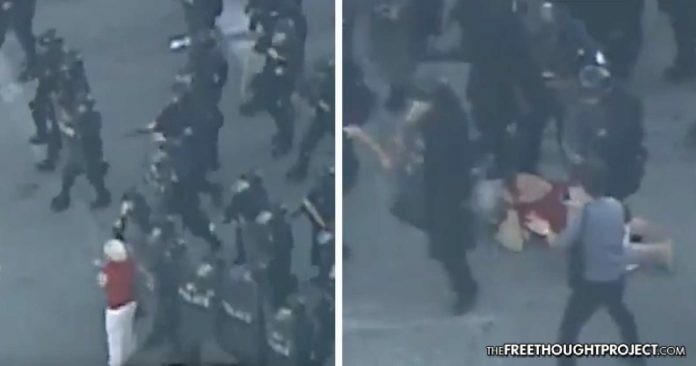 Several officers then walked over the woman as they went after other protesters, seemingly oblivious that they were trampling an older woman who they left lying helpless on the ground. When one officer seemed to notice that the woman was still there, he walked over and started talking to her. Other officers caught on, and one of them reached down and yanked the woman up, off of the ground. However, once she was standing, the officers who surrounded her proceeded to put her in handcuffs. The protests began after Police Officer Jason Stockley was acquitted of the 2011 killing of 24-year-old Anthony Smith. While it has been reported that Stockley shot Smith five times following a police chase, there is much more to the story. It should also be noted that after the shooting, police found a pistol lying in Smith’s vehicle. They used this as justification for the shooting—claiming Stockley feared for his life. However, according to prosecutors, it “was later determined by lab analysis to have only [Stockley’s] DNA on it.” The Dash Cam video, which documents Stockley rummaging through a bag and then disappearing for several minutes, accounts for the time it would have taken Stockley to plant a gun in Smith’s car.